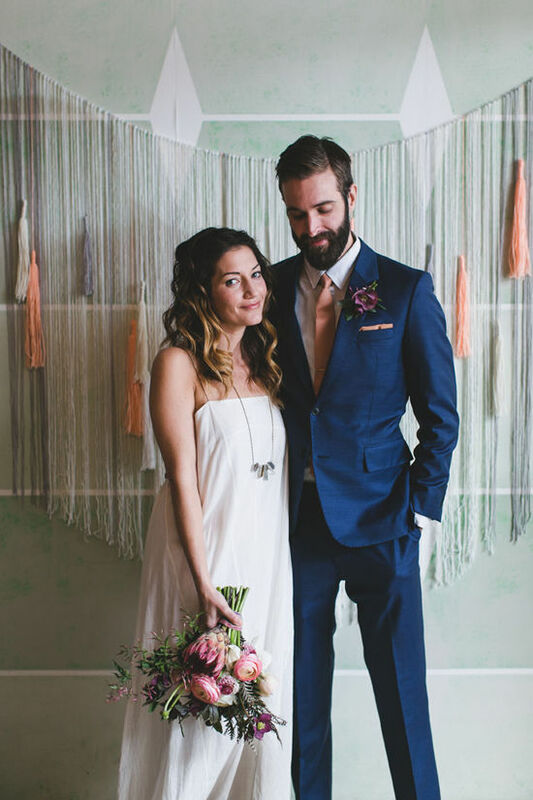 today we’re featuring a very cool wall hanging DIY from michelle bablo who is an NY based event designer, stylist and florist! CLICK THROUGH TO SEE HOW TO MAKE ONE! • yarn. you can use as few or as many colors as you’d like. for this project, we chose three neutral colors & one pop color. • a wooden dowel. ours is 36” long. • Start by making your tassels. Using a ruler, measure a length of yarn to the desired length – for us, that was 12”. Wind the yarn back & forth 10-12 times, creating loops at the top & bottom. This will be the “tassel” part of your tassel. 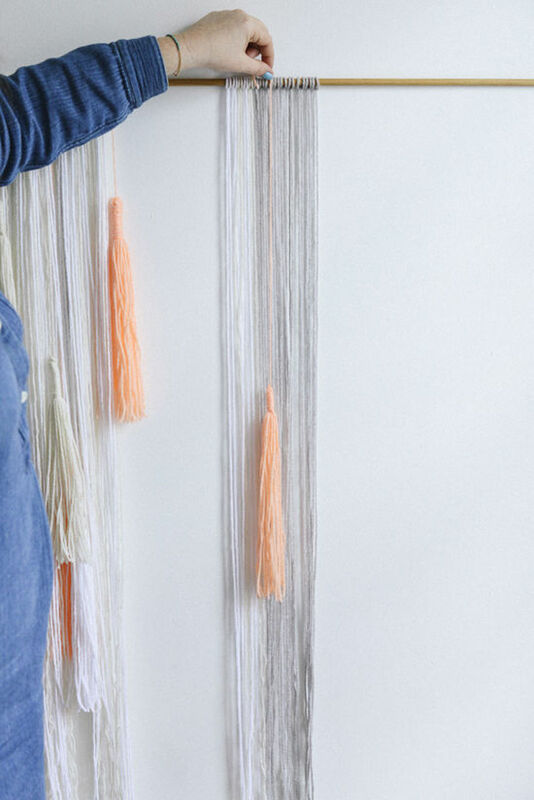 • Measure a piece of yarn in the same color that’s 24-36” in length – or however long you’d like your tassel to hang. 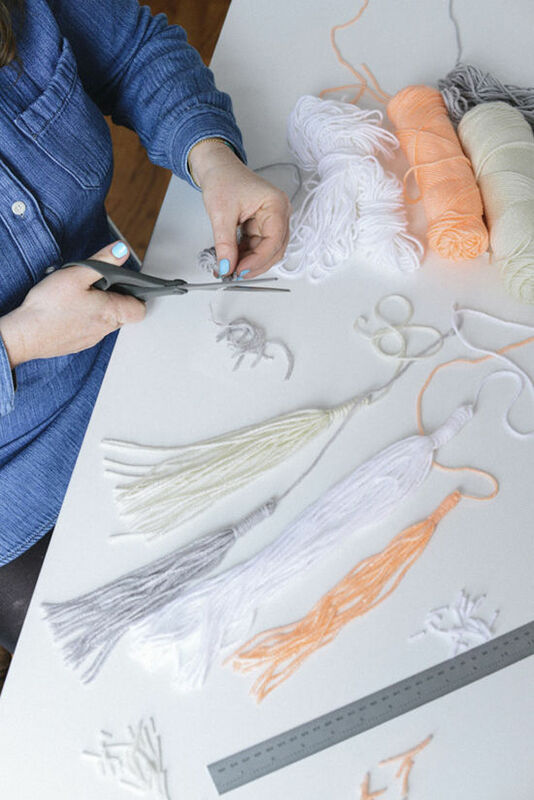 Use the piece to tie a knot at the top of the tassel – going through all of the loops at one end of the tassel. With your scissors, cut off the loops on the other end. • Measure another piece of yarn approximately 24” in length. This will be tied & then wound around the top of the tassel to create the crown. Starting about 2 inches from the top, tie a knot and begin winding up. When you reach the top, use the remaining end to tie a knot. Trim the remaining string. 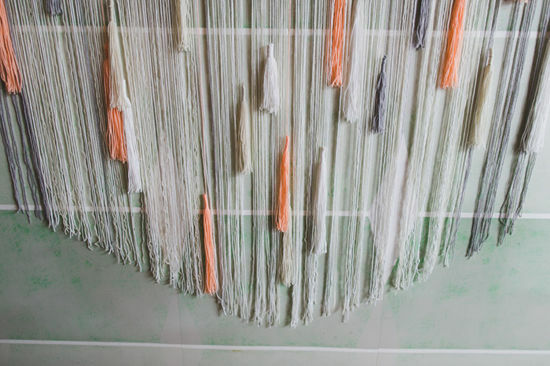 • Create 4-5 tassels in each color in your palette. 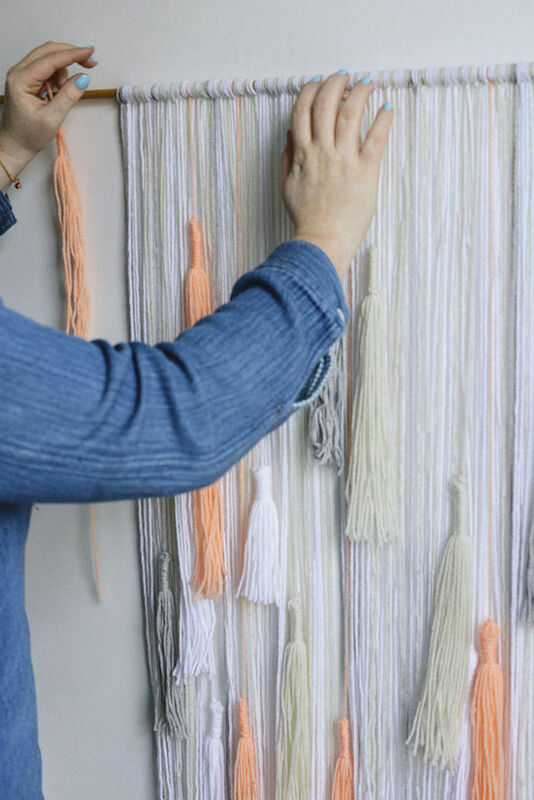 We varied the length of each tassel so they could be layered & create texture. 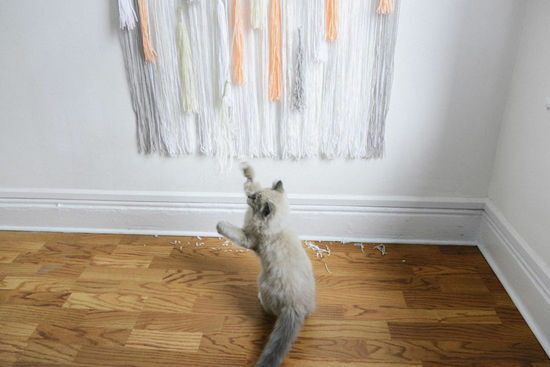 • Next, create the background of the wall hanging. We wanted ours to fill a large white wall, so we made it 4 feet long by 2 1/2 feet wide. Whatever length you choose, cut your pieces of yarn double that amount. So for the base of our wall hanging, each string was 8 feet long. • Loop the doubled piece of yarn around the wooden dowel & pull the ends through – creating a hitch knot. This makes the top of the wall hanging look clean & finished. 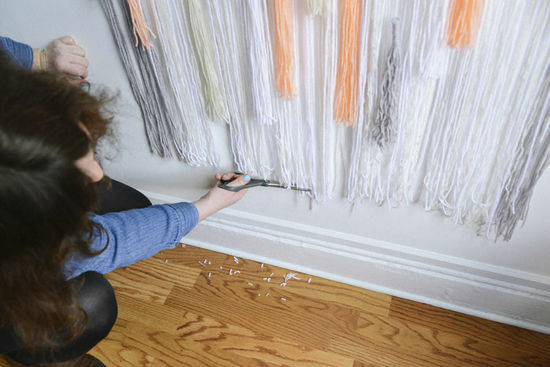 • Continue to add yarn to the dowel to create the background of the wall hanging. We used a pattern of 10 white, 2 cream, 10 white & 1 gray. And then we book-ended the hanging with 20 strands of gray. 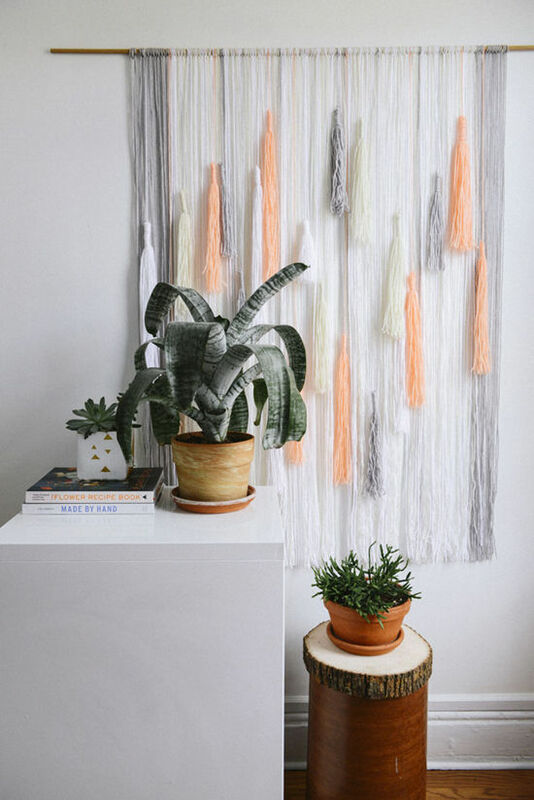 • Once you have the background of the wall hanging complete, start adding your tassels. We didn’t have a specific plan for arranging the tassels. We just wanted it to feel full & textured. Once you know where your tassel goes, tie a small knot around the top of the dowel & trim. Push the knot to the wall-side of the dowel, so that when it hangs the knots aren’t very visible. 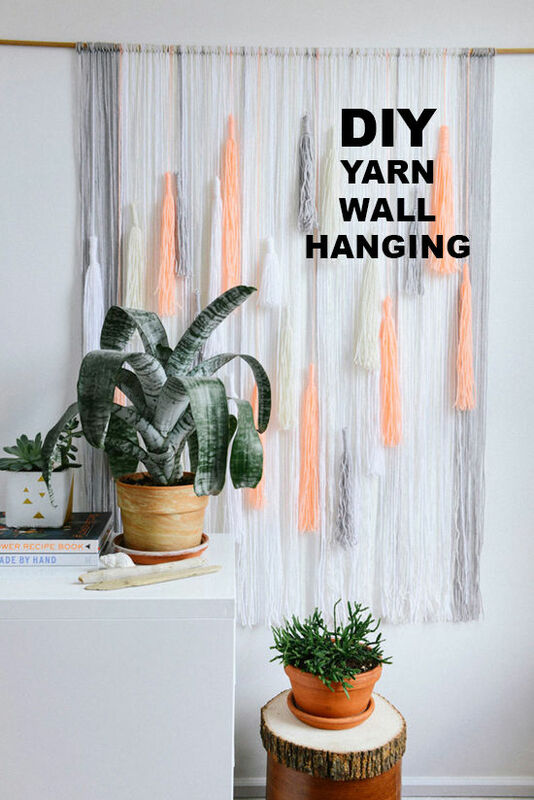 • Once you have all of your tassels attached, trim the bottom of the wall hanging with your fabric scissors. Even if you measure the lengths of yarn, there’s always a little variation because of the way the yarn is spooled. You can use a ruler or just eye it. and maybe hang it somewhere your cat WON’T have a ball with it? ha. this is the perfect DIY for your office or room makeover…and it will also make a beautiful photo backdrop at your next event! see it used here for a wedding. have fun making them! I’m in love with this! I don’t know if I’d take the time to make this though, sadly my cat would find a way to destroy this no matter where I’d hang it. I built a standard frame loom last year and I am still in the process of making a wall hanging, truth be told it’s currently in my garage, but I think you may have inspired me to get it out and try again! I love how cute this looks! I’m having a hard time making the tassels. I think there is something I am missing about the process? 12 inches of yarn isn’t enough to do anything! Thanks so much for the feature! @Shayla after you measure the 12″ you loop the yarn back & forth 10-12 times. That becomes your tassel. Then you tie one end & cut the other end off. Hope that helps! Hi!! I absolutely love this and I was just wondering how you made it hang/work without the dowel, like you have it in the wedding pictures. 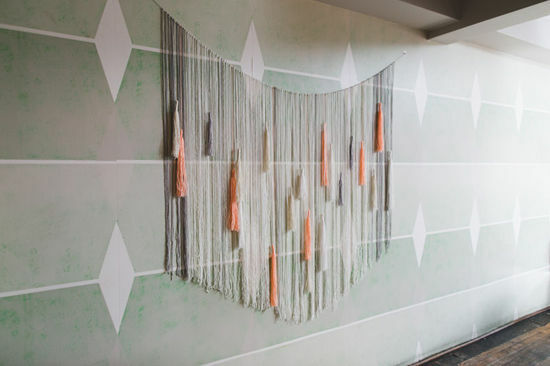 Stunning DIY wall hanging, this would be perfect for my vintage bedroom. Very inspiring! 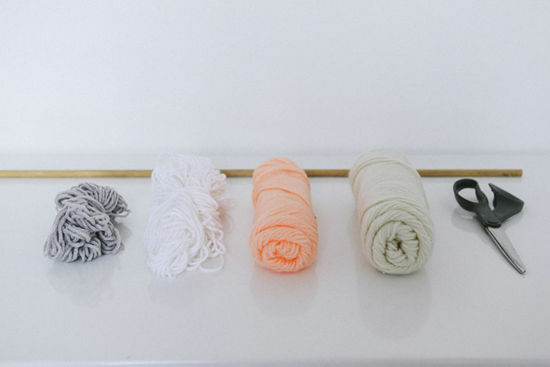 What brand is the bright peach yarn and where did u buy it?